Protect America is a security company based in Texas that provides security systems for homes and vehicles. The company has become very popular over the years and has grown rapidly due to their success in developing and providing DIY security systems around the US. Their home security packages are available for a monthly fee ranging from $19.99 to $42.99, each differing in the number of sensors available. Small apartments can use their $19.99 package, which includes 3 door or window sensors, while larger homes may opt for the more expensive packages. What do the “Protect America” packages include? The only difference between the home security system packages are the number of sensors available. Other than that, all of the Protect America security packages include the same features and capabilities. What’s more, there are no installation fees and the equipment is free for the duration of the package subscription. A customized package is also available to match any need. The company also guarantee that their own security professionals monitor your alarm system 24/7 in order to ensure the safety of your home and family. – A main console to track and manage the other sensors. – 1 motion detector. Additional motion detectors can be added to your package for a fee. – 3-7 door and window sensors. The monitoring method differs depending on the package and is either landline, broadband, or cellular. Click here to get a free quote. How do the alarms work? Sensors are placed throughout your home, on doors and windows, and in certain additional locations depending on the required security, the structure of your home, and the additional sensors you purchased with your package. These sensors activate the alarm whenever they are tripped. 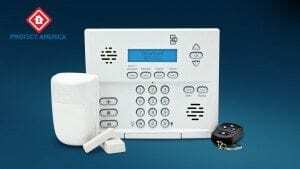 Once an alarm is triggered, you have a predetermined amount of time to enter your code to turn the alarm off. If you don’t do this within the set timeframe or enter a wrong code, the monitoring station is informed. Once that happens, they will attempt to call you at your home and mobile phone to determine if it is a false alarm or if there is really an emergency. If they suspect that there is an actual emergency, the authorities are called, as well as a list of emergency contacts that you provided when the system was installed. What kind of help and support is available? The security systems provided by Protect America are installed by you, the customer, so they have been created in a way to ensure easy installation. Because customers pay a monthly fee, the devices are free and warranted at all times. That means that if a device malfunctions, you can contact customer support for quick resent instructions. If a device stops working entirely, it is not repaired by the company, but rather a new device is simply shipped over to replace it. Click here to get a free quote.